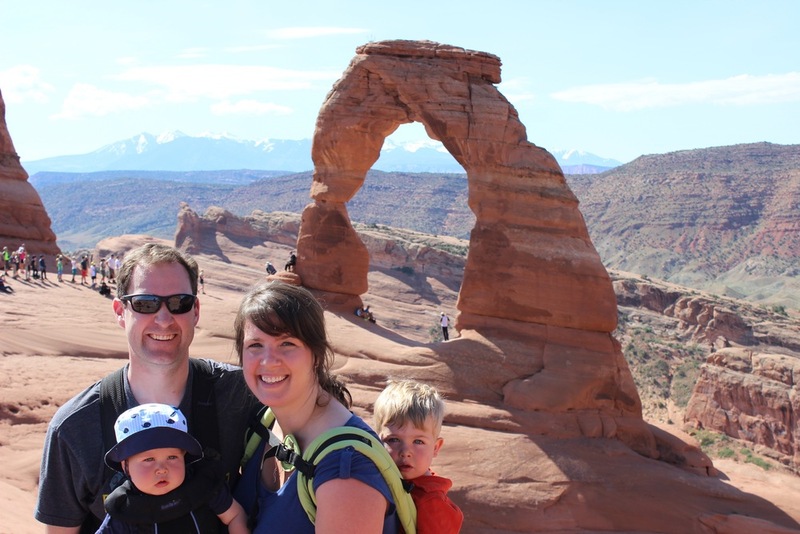 Last week we took a family trip to Moab, Utah. Moab is a tiny tourist town nestled between two epic National Parks - Arches and Canyonlands. The landscape is like something out of a science fiction movie: enormous red earth temples carved by natural erosion in the rocks, land bridges and rock tunnels appearing out of nowhere, sweeping views of canyons larger than the eye can see, dotted with rivers, rocks and dirt roads. It's like no place I've ever been. After spending our first night in the cabin we rented at a local campground, we woke early to beat the desert heat by getting to the Park early for some kids-in-backpacks-and-frontpacks hiking. I packed our lunches and made sure we had enough water while the boys investigated the large ant colony by our picnic table. Cleaning up the breakfast dishes, I surveyed our tiny home-away-from-home and surmised that we were ready to go. Instead of seeing a happy mother of two in a tailored top and carefully selected jeans, I found arm flab and jiggly thighs competing for attention with my tank top and running shorts. It's been a cold spring in Boulder and this moment was the first time I saw myself in summer clothes. It wasn't pretty. The embarrassment was tight in my chest. Is this really what I look like? The shame began to whisper. That's what you get for snacking your way through nap time. I threw off the outfit and changed into a different shirt and shorts combination, realizing as I looked back to the mirror that the clothes were not the problem. I briefly considered wearing jeans, even pulled them out of my suitcase, longing to hide myself in the dark forgiving fabric. Really, Linds? You'd rather hide in your jeans and get heatstroke hiking in 100 degrees then let those hefty gams see some sunlight? I put my shorts back on. The hike to Delicate Arch that morning was incredible. Chris carried the water and we each wore a baby as we made our way up the steep mountain trail without any shade. It was hard work but the payoff was the incomparable views of surrounding canyons. I kept stopping just to say "Wow". At the top, we found a fellow hiker willing to snap our picture. We sat down after we took the photo, getting out water and snacks for the boys. As I held out the straw for Tommy to take a drink, a woman stopped, watching us feed our sweaty babies. "Beautiful," she said. "Just beautiful." Her words landed like arrow, quick and sharp. She wasn't complimenting the way I looked in my shorts or how my tank top accentuated my curves. When she looked at us, enjoying the view and making a memory, she saw beauty. Beauty in being together. So often there's beauty if only you look in the right place. We're home now, with a camera full of pictures and hearts full of sweet memories. I'm tracking calories on my phone in hopes of feeling better in my shorts, while trying to ignore the voice. The voice that says my body isn't what it should be. It's been there for as long as I can remember. It tells me the same stories of shame and failure over and over again. There is some truth to it's claims, but it would have me believe that it is the only thing that matters. Trying something new matters more. Enjoying the once in a lifetime chance to climb red earth canyons to sky high rock towers matters more. I choose what matters more. So if you need me, I'll be rocking some shorts to play with my babies in the Boulder summer sun. And looking for beauty in all the right places. Even in pictures I told Chris to delete. Friends - are you choosing what matters more? How do you quiet "the voice"? Here's hoping you're finding ways to make the most of your one wild and precious life.